We might still be in the final weeks of winter, but we can turn up the heat by incorporating chillies and peppers into our menu. Mexican Chillies and Peppers obviously originated in Mexico and are part of the capsicum family. They are now used in cuisines all over the world. But which ones should you choose? There are so many options when it comes to Mexican Chillies and Peppers, that we are spoilt for choice. Should you try dried or canned, or go for the powdered variety? Each has its own advantages, and it really comes down to your own cooking style, and preferences. These are exactly as described. Dried chillies are whole or part chillies that are dried in order to preserve them. They are great for infusing flavour and heat slowly into meals or stocks. You can also rehydrate them to use in pastes. If you really want to bring out their flavour, make sure you toast them before you use them – this enhances all of the wonderful tastes and aromas that you get from chilli. The aromatic heat of fresh chillies with the convenience of preserved, canned goods! Canned chillies should be a pantry staple for anyone who loves some spice in their dishes. You use these exactly the same way you would use fresh chillies. They add impact when it comes to heat and flavour, and have a quicker burn that dried chillies. Chilli powders are a convenient way to add flavour and spice to your dishes. They have a long shelf life and are easy to store and use. Like dried chillies, they have a slower burn than fresh or canned, and are a great way to infuse flavour and heat into slow-cooked meals or components. 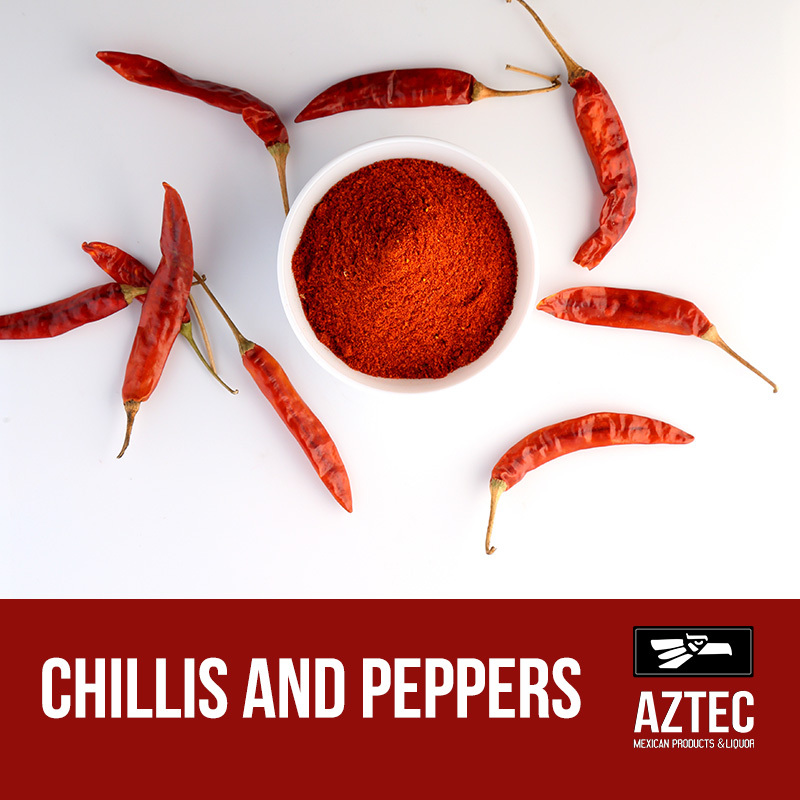 When using chilli powders, make sure to heat or toast them before you use them to release the flavours, and use them in meals such as stews, where they have time to integrate with the dish. The last thing you want is a raw powder flavour in your dinner! These are notorious, and not for the faint-hearted. Jalapenos are the holy grail of Mexican chillies and peppers. The heat level of jalapeno peppers varies depending on cultivation and preparation. When you use jalapeno peppers that have been canned in their juices you can guarantee a flavourful kick – as the peppers sit in their juices, they mature over time and increase in intensity. Chipotle and Serrano peppers are commonly used in a variety of Mexican dishes, and bring their own flavours to the dishes. From the smoky goodness of chipotle peppers, to the spicy impact of Serrano peppers, you can be sure that your meal will taste rich and authentic. When it comes to chillies and peppers, each have their own unique elements, and prove that a chilli is not just a chilli! If you are in the hospitality or foodservice industry, you can check out our chillies and peppers first hand at the Fine Food Australia Expo, 10-13 September 2018, at the Melbourne Convention & Exhibition Centre. Vendors from all corners of the industry will be coming together under one roof, to share their finest products! If you would like to order our products directly, head over to our website and online store, and Like our Facebook page for more information about all things Mexico!